With all these deadly serious things I do in my life all I end up talking about in this blog are childish things like games consoles, MMOs, TV and, yes, the Second Edition of the Doctor Who Sticker Album! I must be doing something right! Clearly last years album did well enough to make a second worthwhile for Merlin. I had no idea sticker albums still existed! I’d like to think that these Doctor Who albums have helped create a resurgence in the products but I see they also do the likes of WWF wrestling (or whatever they call it this week), Barbie, Pokémon and the big one, no doubt, Premier League Football. I suspect there aren’t many grown ups buying many of those, though. Yes, I know, there are probably only a few of the saddest old fans buying the Doctor Who ones, too. So, who else is going to join me for swapsies this time then?! It’s all over for Sam Tyler, or is it? Well,as you have all probably seen,it was the last episode of Life On Mars last night.I failed to see the first series but curiousity drove me to see the second series.And all I can say is that I will be hastily borrowing the first series box set off one of my mates to watch avidly. Well,what do you all think of the last episode?As for my personal opinion,it was a very Prisoner-esque ending.Does he escape from The Village or is it all an illusion?Does Sam Tyler finally go back to the present day or is he actually residing in 1973 and the future is all a concoction of his comatose brain.There is a lot of speculation about what actually happened to Sam in the last episode but my own personal conclusion is that he experienced a ‘flash foward’ to the present day.He complained that he could not feel any sensation and had to find out the hard way by jumping off the roof of his police headquarters,confirming that he was indeed residing in 1973. At least it ended on a happy note where he finally works out where he belongs,he gets the girl and is subject to the whim of a foul mouthed,politically incorrect superior officer.The final appearance of the Test Card Girl,for some strange reason,reminded me of the Thats All Folks segment at the end of all Warner Bros cartoon strips. A bloody good series and it almost makes me glad to pay the licence fee.We shall just have to wait and see what happens and whether any light can be shed on what happened in ‘Ashes To Ashes….. I couldn’t help myself. The urge was too strong. I could hold out no longer and splashed out on a Nintendo DS. My white Wii has impressed so many that I decided to match it and buy a white DS. Except I couldn’t. For about a week I looked around the town centre and online, searching for the best deals. £99.99 is the RRP and everyone appears to be sticking to it. Even the likes of Play.com and Amazon.co.uk aren’t discounting the unit (well, Amazon have it for £99.98!) Reports had it, that over the Christmas period, shops had sold out of both the Wii and DS. Even now, four months after launch, I have yet to actually see a Wii on a shop shelf anywhere (and I do keep an eye out, out of interest). Fortunately the DS isn’t quite so rare now but I still had some trouble. The best place I could find was GameStation in town. £154.99 for a DS Lite (the newer remodelled DS, much sleeker and less Fisher Price looking) plus any three games. I went in there and of the three colour options (black, white and pink) they only had pink left. Not really my style, so I left grumpilly wondering if I’d find one anywhere else. Then I remembered – the local Blockbuster rental store had a GameStation franchise inside. I rushed off to another part of town, asked the same question I had opened with at the other shop (“Can I include pre-owned games in the 3 game DS bundle?”) and this time I had the reply ‘Yes, we only have black and pink DSes in stock, though’ – much better than ‘Yes, we only have pink DSes in stock, though’! I’d really wanted a white (for one thing the black really shows up the finger marks – as I knew from two colleagues who also have black DSes). Nonetheless, black would do! Little wonder nowhere is discounting the DS – why would they when it sells so easily at full price? Now I am one more to add to those statistics. A fews days or so before I bought my DS I saw the incredible news story that Nintendo had sold over 3 million DSes in the UK alone. 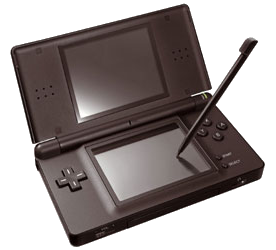 Many news sites also gave the DS as having 68% of the UK handheld market, with the remaining 32% split in some way between the Nintendo Gameboy Advance (still going strong despite the DS’s appearance) and the Sony PSP. This makes me wonder about the PlayStation3’s future in the UK, too – according to the BBC when the PSP was launched it sold almost twice as many as the DS at launch and becoming the ‘fastest selling games console of all time’ in the UK until the PS3 beat it. Now look at the situation with the PSP – less than a million units sold compared to over three million. I don’t think either the PSP or the PS3 are going to disappear (at least not until their natural product life cycles come to an end in five years or so) but it is a testament to Nintendo’s concentration on the devices as games machines and putting the enjoyment factor before the cool gadget features. The odd thing is I am normally the type of person who would go for the gadgets – I’m a natural PSP user. Nintendo really must be doing something right to get me onboard. In fact it is a direct result of how impressed I am about the Wii that I bought a DS. No doubt it will work the other way for DS owners who haven’t yet got a Wii. The only problem I’ve been having is finding the cream of the crop of games. Two games I wanted to buy with my DS were ‘Advance Wars: Dual Strike’ (note the clever pun on DS!) and ‘Another Code’. Both are slightly older games and universally appeared to have gained ‘top game’ honours at various websites and games magazines. Naturally they were impossible to buy new, their initial publishing run in this country long since having sold out. DS games seem to come in at basically two price points. £29.99 for the top games and £19.99 for the older games and more budget audience aimed games. I’m sure both of these games I was after would have come out at £29.99 and stayed there until sold out. Fortunately both GameStations had one of each game in their pre-owned section. I think one was £24.99 and the other £26.99! More expensive than most new games!! That’s why I made sure pre-owned were included in the 3 game bundle! Advance Wars is Turn Based Strategy game (similar to Civilisation), Another Code is a graphical adventure game (similar in concept to Myst) and the third game I bought was a new game (in the £19.99 section!) called Age of Empires – another strategy game (that many PC gamers will already know – and no, no Microsoft involvement in this port!). All three make fantastic use of the dual screens and touch screen functionality. Since then I’ve gone on the buy Big Brain Academy and Wario Ware: Touched. The DS is a great little device – all the fun of playing with my wii but in public!